Buyers today don’t have the time nor the interest to read through lots of information to find what they’re looking for. They expect an experience with your brand that is aligned with what they want. And they want to find that information easily, and quickly. By providing helpful, relevant and valuable content at the right time and place, you’ll be able to successfully attract and convert more people to your brand. 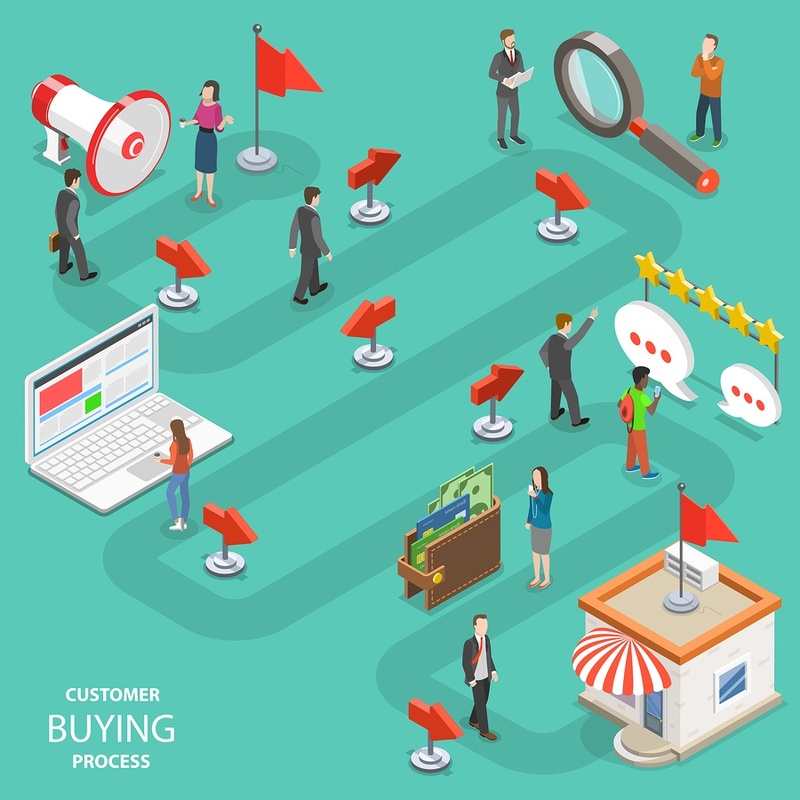 Mapping the buyer’s journey adds an extra level of depth to your content strategy and will help you align your content to what your buyers are looking for as they move through the awareness, consideration and decision stage of the buyer’s journey. Here is how you can map the buyer’s journey in 5 steps. When it comes to mapping the buyer’s journey, it is important you have developed buyer personas. Buyer personas are critical when it comes to determining what kind of content you should be creating, the style and delivery of your content, topics and more. If you’ve never created a buyer persona before, here’s a quick how-to guide. Personas are built on key pieces of information about your target audience, such as: age, income, location, job, family, key responsibilities, goals, pain points, preferred content formats and more. It is important you take the time to create well-rounded and in-depth buyer personas. Content strategies can fail when they haven’t been built with the buyer in mind. False personas are created when marketers develop personas based on guesswork. Buyer personas must be built on data. It’s important to consider the types of questions your customers are asking along their buyers’ journey. The buyer’s journey begins in the awareness stage. This is where buyers will be turning to Google to asks questions that will solve a problem they have, or to learn more about an opportunity they want to pursue. During the consideration stage, buyers are evaluating their options. During the final decision stage, buyers decide the best solution for them and which vendor will be able to provide that solution. By talking to your customers about the questions they have at each stage of the buyer’s journey, you will have a better understanding of the content this is going to be of interest and value to them. This allows you to develop unique, relevant and valuable content that aligns with what they are searching for. Do not underestimate the importance of the format of your content at each stage of the buyer’s journey. During the awareness stage, people realise they have a problem or challenge that is preventing them from achieving a certain objective and goal, and they need a solution. Content at this stage should address that problem or need, articles that work well are: ‘How to…’, ‘A guide to…’ etc. Blog article, guides, webinars and eBooks are all great for the awareness stage of the buyers’ journey. During the consideration stage, people are able to define their problem and begin actively researching solutions. At this point, consumers are looking for information that is more specific about a certain solution. Resources that are valuable at this stage should educate people on the various solutions understanding costs, pros and cons, comparison sheets, buyers’ guides and checklists. Once a buyer has reached the decision stage, they are at the point where they are ready to choose a company to help them solve their problem. Resources that are valuable at this stage educate people on your brand, including: case studies, success stories, awards etc. Free trials, product demonstrations and complimentary consultations are valuable at this stage. Your buyer persona may have a typical way of searching for the information they need. This could include social media, forums, events, review sites, webinars and so on. It’s important you identify where your buyers go for answers, and who they trust, so you can promote and distribute your content successfully. We know content is king, and so is the global giant Google. Google is especially important during the first two stages of the buyer’s journey, as it’s the most likely place consumers will head to when looking for information. If you can identify the keywords and phrases consumers use to find answers and then use those keywords throughout your content, you are much more likely to be found by buyers. Short-tail keywords are effective and will attract people to your website, but long-tail keywords will provide you with more quality traffic as you’re aligning your content to the precise needs of your consumers. When developing your personas, consider the keywords they might use when carrying out an online search and use this information to optimise your copy. How Will Buyer Personas Help My Business?